Sentimental Southern Californians who remember celebrating birthdays, soccer tournaments and the like at Farrell's have watched the decline of this faux fin de siècle ice cream "parlour" (complete with a superfluous British "U") with dismay and resignation. After years on the wane -- flagging consumer interest, mismanagement and shuttered locations -- Farrell's is trying to rebuild its shaky brand. In the year 2011, can a self-consciously old-timey ice cream shop, a simulacrum of wholesome, ante-modern America complete with cheerful teenagers in pinstriped vests and fake straw boaters, survive the relentless homogenization of entertainment and food culture? Yes and no. The last Farrell's outpost in greater L.A. lies way past the San Fernando Valley, at the top of a hill in Santa Clarita, anchoring the Mountasia Family Fun Center. (The only other Southern California location is in Mission Viejo.) 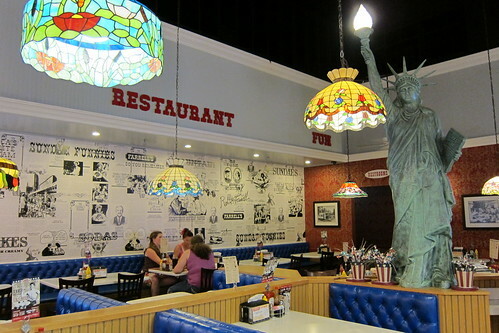 Like all Farrell's locations, it boasts barrels of Necco Wafers and Bit-O-Honeys and a candy counter piled with rainbow-colored candy sticks, jawbreakers the size of softballs and modern confections like Pop Rocks. A typical Saturday afternoon will find half-a-dozen children's birthday parties cycling in and out of the spacious dining area. That means the inevitable banging of the Farrell's drum as employees gather to celebrate the Zoo or the Hot Fudge Volcano, multi-scoop extravaganzas large enough to feed a platoon of recon Marines or a small army of five-year-olds. Nothing about Farrell's is classy or artisanal, but it is a hell of a lot of fun. The ice cream is pretty standard stuff, so standard it's the exact same ice cream you'll find at Rite Aid. In other words, Farrell's serves one of our very favorite flavors of all-time: Chocolate Malted Krunch! 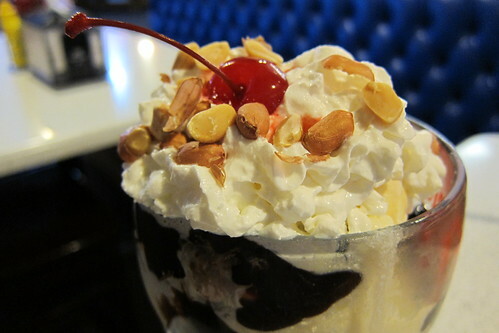 The ice cream sundaes, most of which cost $6.99, are the thing to get at Farrell's. We're partial to the Tin Roof Sundae, vanilla ice cream and hot fudge topped with blistered Spanish peanuts, but the Golddigger, with a double dose of butter pecan ice cream wallowiing in plenty of generic butterscotch sauce is a good bet. If, for some reason, you think you can down one of these in an ungodly amount of time and want to test your competitive eating prowess, you can enter Farrell's ice cream eating challenge and possibly compete in the finals on July 17th. We didn't even attempt it. 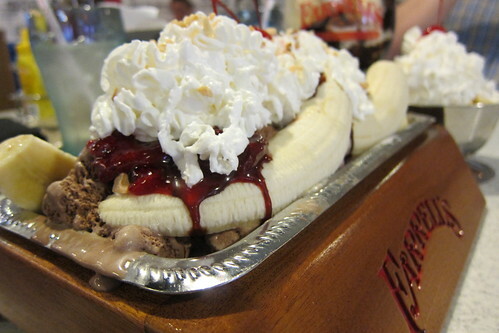 We could barely get through a third of the Pig's Trough, a XXL banana split with two bananas, twice the amount of vanilla, chocolate and strawberry ice cream, three toppings (chocolate sauce, strawberry and pineapple), whipped cream, nuts and a cherry. Like we said, classy it aint. It's also not petite. The portions at Farrell's are generous, and the food is surprisingly good. We expected some sort of bastardized Applebee's but found perfectly credible burgers, sandwiches and fries. The housemade potato chips are freshly fried. They arrive at the table crisp, warm, lightly salted and delicious, and the small basket (only $2.99) was big enough to fill a standard size bag of Kettle chips. Food like this in portions of this size probably never filled the dance halls and saloons of the Gilded Age, but this is definitely the kind of nostalgia we can get behind.